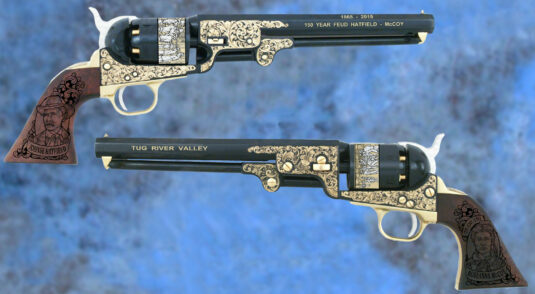 United States Marshals - Ruger Revolver Blue - Wellington LTD.
We have a number of United States Marshal and Retired Marshal who would like to complete their set by purchasing the Highly Engraved revolver. We will donate a portion of the proceeds to the U.S. Marshal Service Association as we have done from the start of our working with the Association. We are honored to be able to create a Family heirloom for the U.S. Marshal Service employees. Order by December 15th to avoid price increase! EACH EDITION WILL BE LIMITED!! The Hatfield–McCoy feud, or the McCoy-Hatfield feud or the Hatfield–McCoy war as some papers at the time called it, involved two rural families of the West Virginia–Kentucky area along the Tug Fork of the Big Sandy River in the years 1863–1891. The feud has entered the American folklore lexicon as a metonym for any bitterly feuding rival parties. More than a century later, the feud has become synonymous with the perils of family honor, justice, and revenge. 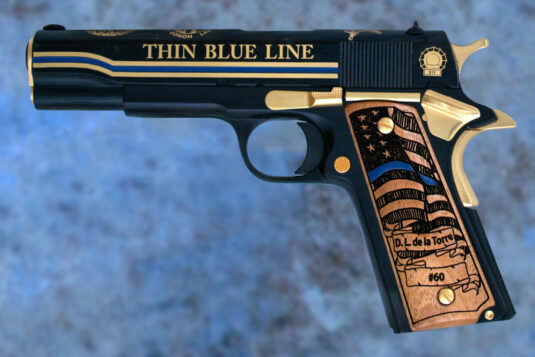 From the beginning of our country’s history one group of professionals has always stood ready to protect and serve citizens from those who would do us harm, to defend the “Thin Blue Line”.In their honor, Wellington LTD is proud to introduce the “Thin Blue Line” special edition!Built on a classic .45 cal 1911 frame and highlighted with 24 karat gold, each can be customized with your name, badge number, and your organization’s name! Wellington LTD is a proud supporter of the law enforcement community, please ask about our fundraising opportunities!Presentation case is available with custom engraved glass! Please call Jim at 970-215-0677 for details. Wellington LTD is proud to present the General William O’ Darby Special Edition. 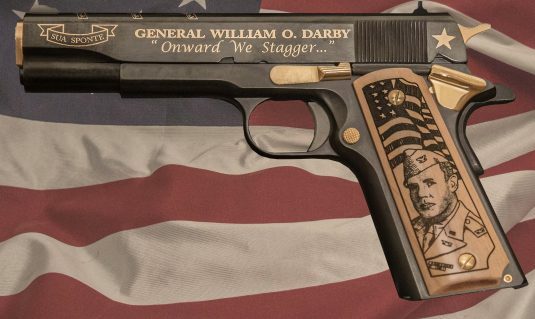 This beautifully crafted family heirloom is a tribute to the life and history of General William O’ Darby and the formation of the U.S. Army Rangers.